Each search engine has a different method for crawling and indexing the world wide web and a host of different algorithms for ranking pages in search results. The algorithms are commercial secrets – to prevent them being stolen by competitors or gamed by SEO specialists – so everything we ‘know’ about them is based on the collective observations of the SEO community, what the companies say publicly and the patent applications that they’ve made. Since it still commands about 90% of all the searches taking place in the UK, and since the other major search engines work in a similar way, I’ll focus on Google. Google uses automated programs (often called robots or spiders) to crawl the web and send back what they find. Provided all is in order the page is now said to be ‘indexed’ and it is ready to be called upon to provide a search result. When someone actually enters a search query how does Google decide which results are relevant and in which order to present them? This is the job of the algorithm. 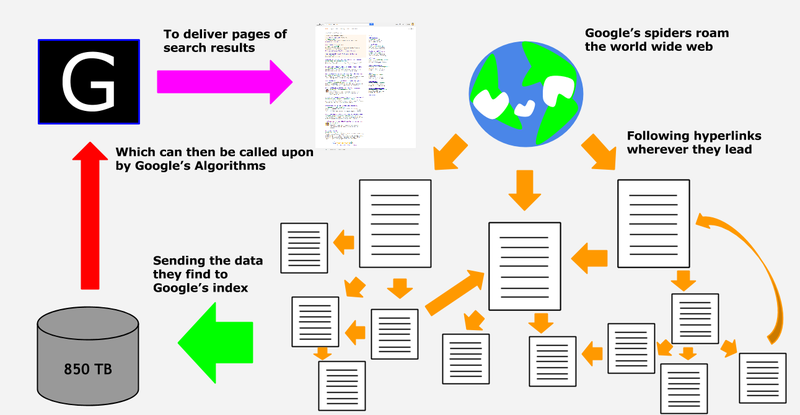 How the algorithm works exactly is unknown but Google says that there are over 200 factors it takes into account to determine the relevancy of a particular page to a particular search query. From Google’s public statements and the work of SEOs over the past 10 years+ we know that they fall into two broad categories: on-page factors and off-page factors. We also know that the most important of these factors include the text content of the page, the way elements are marked-up on the page (both on-page factors) and the number and relevancy of links pointing to the page (an off-page factor). These ‘ranking factors’ are subject to continual change and speculation but if you want to know more there’s a nifty periodic table of ranking factors over at Search Engine Land, based on the prevalent wisdom of the time. Google attained its huge popularity by presenting users with the most relevant results to their search queries. To fend off competition from Yahoo!, Bing and other search engines – and to maximise the profitability of their search advertising – Google is continuously changing the way that search results are displayed. Each time an update is released, and the way search results appear changes, there are winners and losers. The practice of search engine optimisation has changed along with these algorithm updates. Techniques that were common in years gone by – like keyword stuffing or secretly paying other websites to provide links – have been rendered ineffective by Google who increasingly demand high quality content and a natural profile of links pointing to a site. Search engine optimisation is now much more closely aligned to content marketing or PR – well devised content and newsworthy stories are not only more likely to meet search engines desire for quality and freshness but are also more likely to attract natural links and citations from other websites.